Formed in 1997, THE HI-RISERS have released 6 albums so far, containing only the finest Rock & Roll. One can hardly imagine the contemporary Rock & Roll world without this talented trio, consisting of singer and guitarist Greg Townson, singer and bassist Todd Bradley and drummer Jason Smay. They are clearly one of the best existing Rock & Roll bands America has to offer. On top of producing their own albums, they also collaborated with Kaiser George (THE KAISERS), Eddie Angel (LOS STRAITJACKETS, THE NEANDERTHALS); Townson and Bradley even recorded with artists like Rock & Roll star HANK BALLARD, jazz legend BILL DOGGETT, James Brown's bandleader PEE WEE ELLIS, soul artist JOHN ELLISON and many more; and they shared the stage with stars like BO DIDDLEY or DELBERT MCCLINTON. Now the third and fourth album by THE HI-RISERS, LOST WEEKEND and THAT ROCK & ROLL BEAT (already available on CD at SPINOUT RECORDS) will finally be released on vinyl simultaneously (lim.ed. 500) - both albums are music the way it should be, therefore they simply had to be released for black wax enthusiasts by SOUNDFLAT RECORDS! Even though the band consider themselves a rock & roll band, one can find elements of rhythm and blues, merseybeat, surf and 60's garage in their music. The trio delivers perfection in each of these genres; which is why one simply has to love them! The fourth album, THAT ROCK & ROLL BEAT, offers at least the same amount of variety as its predecessor(s). 'Ex-Appeal' is perfect beachsound, while '(Let's Dance) The Freeze' again proves, that this band can deliver brilliant surf-pieces all the same. Their cover of SONNY HALL's classic 'My big fat baby' is even wilder than the original; the combination of a rocking guitar solo and Townson's strong voice is simply stirring. Moreover, the LP includes a skilfull version of RONNIE SELF's 'Houdini' and 'Ready Teddy', first made popular by LITTLE RICHARD. 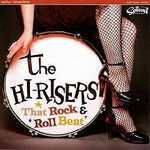 Every fan of Rock & Roll will dig THE HI-RISERS' fourth album THAT ROCK & ROLL BEAT! In spite of this clash of different genres, both LPs still maintain a strong consistency. It seems like everything THE HI-RISERS touch turns into gold.